I've been wanting to use this button for a long time. I'm a Quilt Diva not because I quilt. This Aries doesn't have the patience for that kind of detailed work and delayed gratification. But I love quilts. 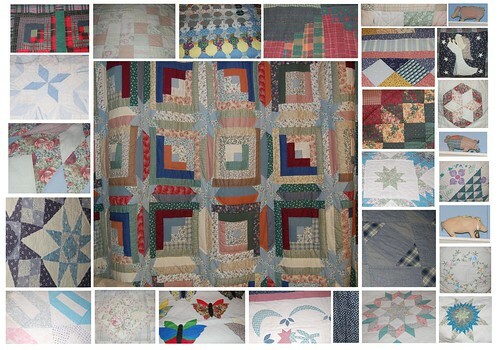 This is a composite of sections of all my quilts. The big one in the center is from my late friend Jeff. One is from my late friend Steve R, who got it from his deceased partner, whose grandmother made it. Four of the quilts are from my mother (she didn't make them, but bought them and gifted them to me over the years). I found the little pigs in an antique shop; they were made from quilts over a hundred years old. The rest of the quilts Tom and I have collected during our twenty-plus years together. The quilts are on beds in our house and Tim's apartment. Some of them hang. Some are part of pillows or table runners. Some are folded in stacks on our window seat. Nothing (except food) makes Margot happier than when I drag a quilt to the couch or the bed for a nap. She snuggles under it, or lies on top of it with her head resting on my ankles. Guinness lies next to it. A few days ago, Tim came over while I was sleeping and whispered to the dogs to come outside. He said they pretended they had to stay in and guard me. But I know they're just Quilt Divas, too.